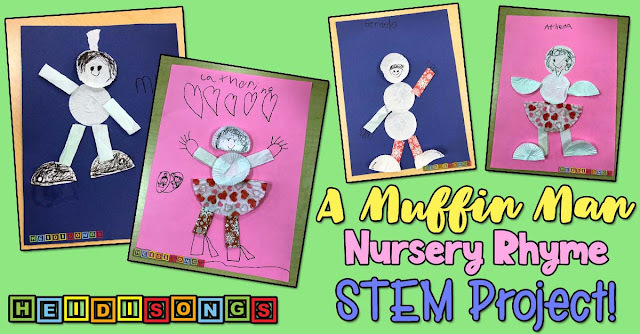 A Muffin Man Nursery Rhyme STEM Project! Here is a great Muffin Man themed STEM project to add to your nursery rhyme unit! It is creative, fun, and only takes a few basic materials. Of course, since it is a literacy based activity, it could also be considered a STREAM project (Science, Technology, Reading Engineering, Arts, Math). All you need are some leftover muffin liners of various colors and designs, paper, markers or crayons, glue, and some imagination! You'll have your kids creating muffin boys, girls, dogs, bunnies, babies, creatures, and anything else they can think of! Go BONKERS with ESGI - Week #3!! Alright, y'all! It's WEEK #3 of the ESGI promotion!!!! Read on for all the details! 1.) 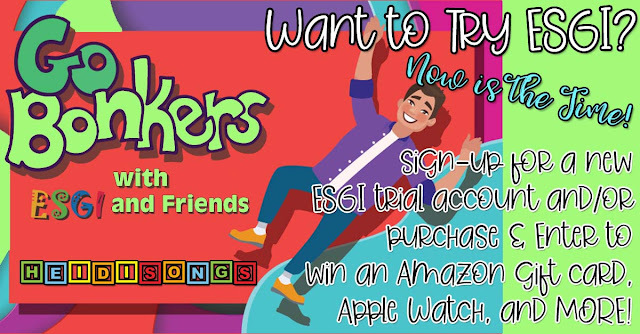 Will be entered to win **$500 Amazon Gift Card or **Apple Watch. 2.) Will receive a $40 discount off their first year purchase. 2.) Will receive a $40 discount off their purchase!! 3.) Will receive a *$50 BERTEAU and Co. gift card with their purchase!! Why Do Some Children Do More Poorly on Writing Tests at School Than They Do At Home? 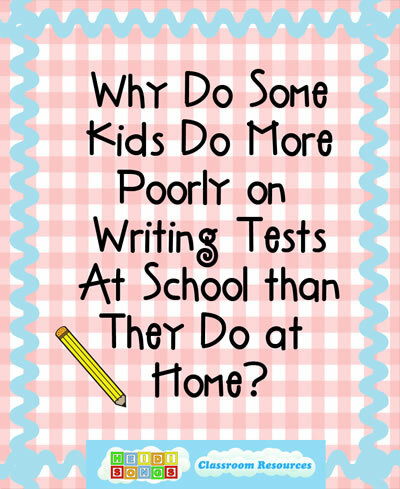 Why do young children often do much worse on writing tests at school than they do at home? This is a very frustrating thing for many parents! Hopefully, this blog post will shed some light on this question, and also help you understand the developmental stages that children pass through as they learn to write. Children learn at a very rapid rate during early childhood, and are continually passing through many stages as their writing develops. Even if parents and teachers coach children to do certain things on tests at school, children generally revert to their true developmental stage in both reading and writing once they are left to do the task completely on their own. In my opinion, this is really the main reason why young children tend to do more poorly on writing tests given at school than at home when they are given even the slightest bit of coaching from their loving parents. From Pre-Writing Strokes to Letters on "Sky Grass Dirt" Paper! This year, we are laying the foundation for writing correctly on lined paper by practicing our pre-writing STROKES on paper with OVERSIZED LINES! And I am SUPER EXCITED to tell you about it, because the results have been just AMAZING so far! I think that this will really prepare them to do nice, neat printing when the time comes! 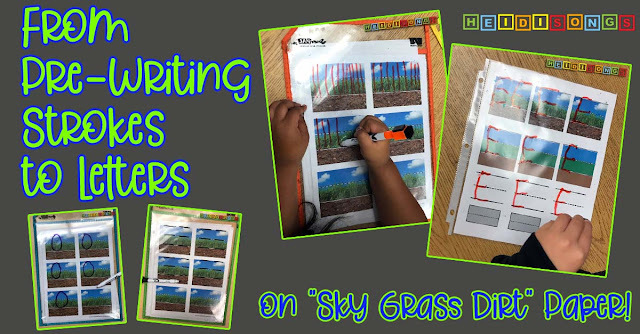 If you read my recent blog post, Tips for Teaching Kids to Write on Lined Paper, then you may remember the "Sky, Fence, Grass, Dirt" style of paper that my teammates and I have been using to teach the kids to print. It is pictured below. I got the idea from the website Educlime.com, which was created by a teacher friend that is an Occupational Therapist! You can find out more about her products on that blog post above that I just referenced. 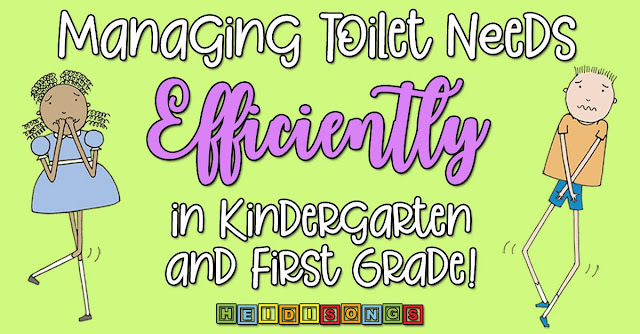 Managing Toilet Needs EFFICIENTLY in Kindergarten & First Grade! Managing the toilet, restroom, bathroom, or potty needs of young children in the kindergarten or first grade classroom can be a challenge! When one child asks to go and is given permission, several other children often ask to go as well. How can you manage toilet needs with a minimum of instructional time wasted, and without touching off a three ring circus in the restroom? Obviously, when nature calls, we have to listen! But with a few good procedures in place, toilet needs can be managed efficiently in the classroom! Here are my rules and procedures for managing restroom needs so that my little ones can use the toilet with minimal lesson disruptions. No Potty "Wannabees" or Buddies! Kids Go ALONE! 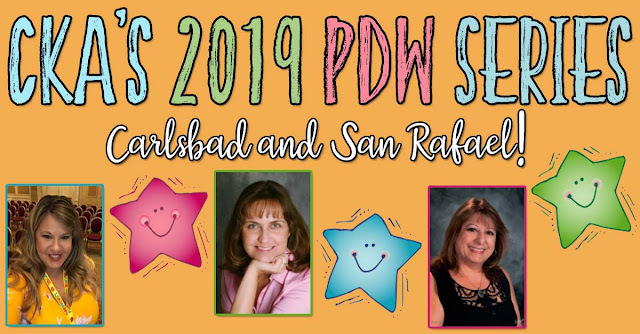 CKA's 2019 PDW Series - Carlsbad and San Rafael! Hey, all!!! I am so excited to share with you the Professional Development Workshops I get to be a part of next month!!! One in Carlsbad, CA and the other in San Rafael, CA! Read on for more info and links to register! What's it about? Reading, Writing and the Flexible Classroom! Who's presenting?Heidi Butkus from HeidiSongs (ME!) and Beth Pittman from Flexible in First! Click here to view the flyer with more details or to register! What's it about? Motivating, engaging, and making learning fun! Who's presenting?Palma Lindsay from KFUNdamentals and Heidi Butkus from HeidiSongs (ME)! This year, all of my students in my half day Transitional Kindergarten (TK) class learned every single letter and sound! 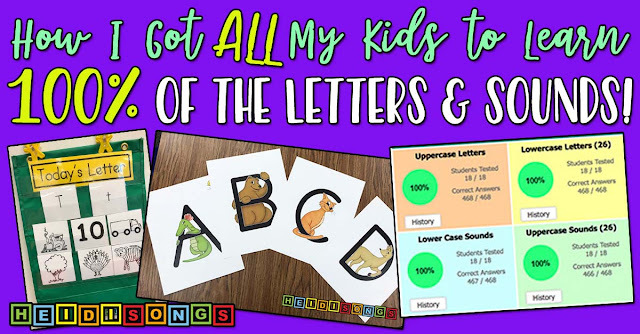 In this post, I will tell you my weekly routines for teaching and reviewing the alphabet and letter sounds that led to 100% mastery for every single student in my class- even the children that struggled to learn! And we only had three hours per day total for every subject, including playtime and recess! Considering how much we accomplished in so little time, I felt that these routines would important to share, since there are so many demands placed on teachers everywhere. Our Transitional Kindergarten students are just four years old when they start school, and must turn five sometime between September 1 and December 2 of the school year in order to qualify for the TK program. They will all start Kindergarten in the fall, totally ready to learn!